Hello all, it's been quite a while since I've posted actively on this forum. The "old-timers" need no introduction from me, but for the newer members who have joined over the past several years, I'm Dman176 (a.k.a. Damon). 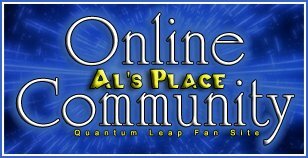 I've contributed to this site over the years, namely in the form of several "episodes" for The Virtual Seasons toward the end (or indefinite hiatus). As many of you may know, I used to be a very active member and writer in this community (even a moderator at one point) until real life threw me a number of rough fights over the past decade. (I suffer from Bipolar II Disorder and Obsessive-Compulsive Personality Disorder, was hospitalized for a time, and other numerous family/personal issues which I won't go into.) Suffice it to say, I kind of drifted away but have always checked in from time to time just to see if any further QL news surfaced or what people were discussing. Anyway, the main point of this post is to share some exciting personal news! After 40 years as a confirmed bachelor, I am finally getting MARRIED! Those of you who are friends with me on FaceBook may already be following my journey. But what makes this wedding so special in particular is that we are doing something somewhat unique: my fiancée Amada and I are legally getting married this coming Monday, February 29... LEAP DAY!!! And yes, the reason why we chose that day is because we are both huge Quantum Leap fans (which is one of the main reasons that brought us closer together). What will make this even more interesting is, because Leap Day this year is on a Monday, it became a little difficult to get a lot of our family and close friends together to celebrate. So, we're having the main ceremony 8 months from now on October 29 (a Saturday). In a sense, we will be getting married twice and the theme of the wedding is time-travel with the main focus being on Quantum Leap. We will be inviting guests to "leap forward in time" with us and come dressed in different eras throughout our lifetimes. The room itself will be lit up in bright blues with a huge dome-like chandelier in the center of the room that kind of looks like Ziggy. We're looking forward to giving everyone an experience they'll never forget. We've thought up a few details already: down to the groomsmen wearing light-up neon stars on their lapels (like Al wore) to the bridesmaids wearing light-up bracelets around their wrists, balls of string as wedding favors, and of course having the DJ play music from many different eras. At any rate, I will be trying to make my gradual return to Al's Place when I get some down-time, mainly to check in and share more details if anyone's interested. Until next time, my friends! Wishing you all the best for the weddings and for your future happiness together. What a cool idea. Anyway, we're both pretty blown away by this! Of all the couples who got married yesterday, the reporter picked us. Amada somehow attracts that from the universe. I thought that this is definitely something that needed to be shared with the QL community! Until next time! I've seen your wedding pictures on Facebook, Damon, and I must say that you and Amada make a lovely couple. May you and your lovely wife be blessed with many, many happy years together!